June is Burger Extravaganza Month here at Foodo. After moving to the great northwest I became motivated to get out and start exercising again. With the kids in school I have lots of time to train. I decided to sign up to do the Danskin Triathlon which will be held in Seattle on Aug 15th. It consists of a 1/2 mile swim, 12 mile bike and a 5K run. I love the biking and swimming portions but the running is my least favorite. Last time I did a triathlon was 7 yrs ago and I trained hard but didn’t lose any weight because I was always drinking sports drinks and eating power bars etc… This time I am taking a different approach. Still exercising 5 days a week alternating between the 3 events but I am eating differently. I am not cutting out meat completely but trying some healthy options. I often forget about making Portabella burgers but once again my husband (the shopper) found them on sale and brought home the biggest most beautiful mushrooms and I couldn’t wait to grill them up. And then to just top it off you can serve them with baked sweet potato fries. I have been using sweet potatoes in place of regular potatoes in many of our dishes. So here you go, my favorite veggie burger. It is so satisfying I don’t miss the meat at all!! Place the mushroom caps, smooth side up, in a shallow dish. In a small bowl, whisk together vinegar, oil, basil, oregano, garlic, salt, and pepper. Pour over the mushrooms. Let stand at room temperature for 15 minutes or so, turning a few times. Preheat grill for medium-high heat. Brush grate with oil. Place mushrooms on the grill, reserving marinade for basting. Grill for 5 to 8 minutes on each side, or until tender. Brush with marinade frequently. Top with cheese during the last 2 minutes of grilling. Place on bun with mayo and Dijon mustard. I also added tomato and lettuce. I’ll pass this recipe on to my mom. I love the subtle allium in the background! Thanks for noticing! I planted a bunch last fall, but only this one came up 😦 Those darned squirrels ate them up. Your exercise regimen is inspiring! 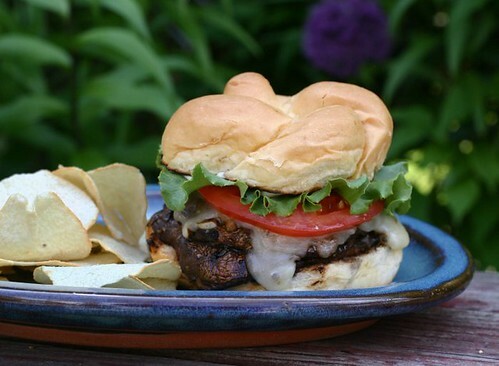 I do love portebello burgers, though I always like to add a sauce with a little kick to offset some of the mushroom’s earthiness-maybe some wasabi or chipotle mayo. I’ll have to try this marinated version; perhaps the vinegar’s tanginess will do the same thing. Best of luck!! You’re amazing! I love portobello burgers! These look really tasty. Good luck on your race! Boy, I’m a meat lover but that gorgeous photo makes even me think these would be excellent! I love Portobello Burgers!!! YUM! Yummy! I love portobello burgers. I’m craving one now. So happy you have a veggie burger up! Love a good portobello burger! Thank you for inspiring me. I’m not a big “meat” fan so hamburgers are not on my plate except in an emergency. However, I’m going for the Portobello Burger. I can’t wait to make it. Good luck in the triathlon. I admire your ability to be able to do that. Great portabello burger. They really can be as tasty as meat burgers. I love mushrooms! They’ve been my fave veggie ever since I gave up meat. I like your suggestion of the sweet potato fries too…can’t get enough of them! Simply Delicious! I think this would help with the world cup blues. This would be a tasty mushroom burger! I’ve had portobello burgers before. They are just delicious but I really like the marinade you made. This sounds terrific. I really, really dislike the taste of balsamic vinegar. Is there anything else that I can marinate the mushrooms with? The burger looks phenomenal!